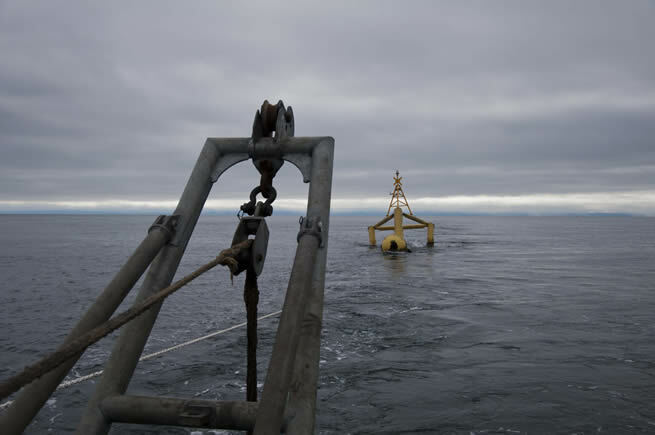 Oceanflow's 35kW Evopod unit has completed the first phase of its in-sea trials to demonstrate the reliability of key systems and components. E35-01 has been deployed in Sanda Sound for over one year to test mooring system components, power electronics and subsea power distribution systems. 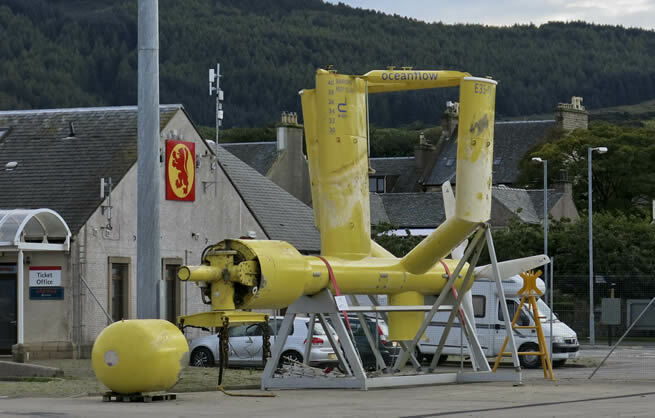 The ¼ scale device which incorporates a number of key technologies developed by Oceanflow has recently been recovered to Campbeltown Harbour after being continuously deployed in Sanda Sound, South Kintyre from the 7th August 2014 to the 7th September 2015. The generator, inverter drive and instrumentation package installed inside E35's watertight hull maintained full operability after the 13 month trial period. The power conversion components were specially configured in a plug-in cassette mounting by Optima Control Solutions, a Siemens Solution Partner. "It is a particularly successful outcome that the power conversion and instrumentation systems within the submerged Evopod hull have performed well, despite continuous exposure to the wave motion in Sanda Sound"
Other aspects of the one year trials that were particularly satisfactory was the performance of the Oceanflow developed turret mooring system with power export swivel and the reliability of the all chain catenary mooring system. The unit is currently on Campbeltown quayside being prepared for re-deployment at Sanda Sound. When reinstalled on its moorings the generating device will be hooked up to a subsea transformer unit sending power back ashore into the grid at Southend.